Dr. Jingyi Fei published her article "Determination of in vivo target search kinetics of regulatory noncoding RNA" in Science. 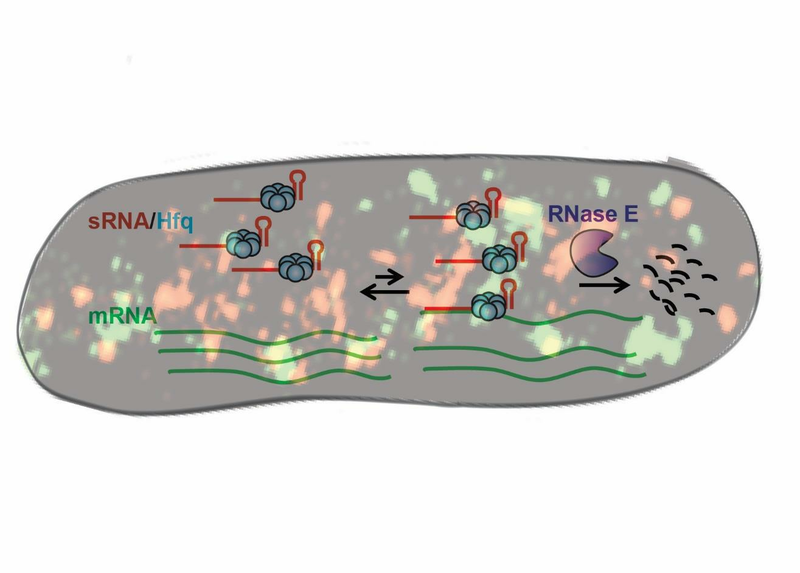 Small noncoding RNAs (sRNAs) are important regulators for gene expression in all kingdoms of life. In the most common scenario, they function by a “search-and-execute” mechanism, i.e. base pairing with the target messenger RNAs (mRNAs) through a stretch of complementary sequence followed by translational repression and/or the induced-degradation of the mRNAs. CPLC postdoctoral fellow, Jingyi Fei, led a collaboration between the Ha group at CPLC and IGB and the Vanderpool group in the Department of Microbiology on campus, and presented the first kinetic characterization of sRNA-mediated target mRNA degradation in vivo, using a super-resolution imaging and analysis platform. They used a sugar-phosphate stress induced sRNA, SgrS, as a model system, and found that the formation of SgrS-mRNA complex is the rate-limiting step, dictating its overall regulation efficiency. Surprisingly, binding of SgrS to the target mRNA is highly dynamic in vivo, with dissociate rate about two orders of magnitude larger than the in vitro measured, indicating an active recycling of sRNA from the sRNA-mRNA complex in the cell. Fine-tuning the target search kinetics allows additional control over regulation efficiency and contributes to setting the regulation priority among different target mRNAs by the same sRNA.